When her grandmother could no longer turn the crank handle of her Ford Prefect, Leone Hutton decided it was time to get them a new car. They traded the Prefect in for a VW Beetle: “My grandmother said it was a smoother ride than the Morris Minor we tried,” explains Leone. She liked it so much, she traded up to a brand new 1500cc VW Beetle in 1969 – and has kept it ever since. Last November, and recovering from eye surgery and facing a battle with leukaemia, Leone decided her driving days were over and it was time to part with her much-loved Bug. The scheme, run by the charity Kids Under Cover, collects unwanted cars and converts them to cash. Some cars are officially ‘dead’, some too expensive to keep running and others, like Leone’s, are simply no longer needed. The cars are sold at auction and the proceeds used to provide homes, education and support to kids who are at risk of homelessness. Kids Under Cover installs a demountable studio in the backyard of the family or carer’s home – it provides personal space, reduces overcrowding, and keeps families together while offering kids a stable, safe home environment. The added option of a scholarship and mentor often completes the package. In 2009, the charity built a record 62 studios and awarded 40 scholarships. Since the Donate Your Car scheme started in 2006 – based on a successful American model, Kids Under Cover has been given about seven cars a month: specifically 494 cars, one caravan, two motorbikes and one campervan, raising more than $310,000. Donate Your Car is a natural fit for former car dealer Ken Morgan, who became known for giving away cars virtually every weekend on the TV program Hey, Hey, It’s Saturday! He set up Kids Under Cover in 1989, and has since extended the program to Queensland and the ACT, earning him the Order of Australia Medal in 2011. While Donate Your Car is a national scheme, it has enjoyed its biggest success in Victoria, largely due to three key partners: the car auction group Manheim, which collects and auctions the cars at no cost; Just Cars, which provides free online booking and publicity; and J.C. Decaux advertising, which provides free space on boards across Melbourne. Leone’s beloved car was in excellent condition and the story of its “one lady owner” soon spread, so the team at Manheim banded together to buff, polish and restore some of the vintage VW’s former glory. 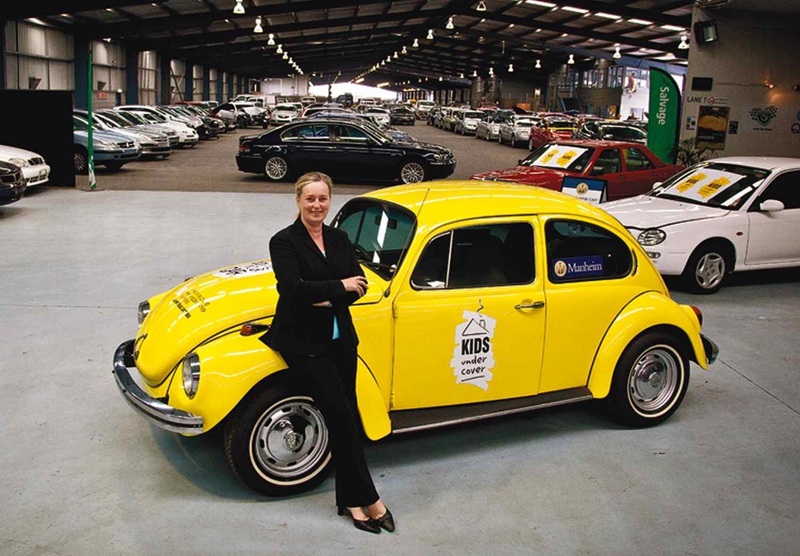 The beloved Beetle sold for $7000 – which Leone says is about three times what she paid for it. Another car has recently been donated by Year 11 and 12 students at Camperdown College. As part of a personal development course, the students researched how to rid the car of rust and other problems. While it is not roadworthy, they thought it could help raise some funds for other young Australians. Recently a rare classic was donated - a 1965 Humber Vogue, built at the Rootes Australia factory in Port Melbourne. “My father bought if from new,” recalls octogenarian Geoff Hardy, who donated the car. “It’s the upmarket version of the Hillman but the baby brother of the (Humber) Hawk – a very practical little car. “After he died in 1971 my mother drove it and then I drove it for her when she got older. But apart from a couple of interstate trips, it’s just had runabout trips a couple of times a week, or been sitting in a garage in Malvern East. How it works: Cars, boats, caravans, trucks and motorbikes are all welcome; it does not have to be running, but check with Kids Under Cover if you live more than 100km from Melbourne. The ATO allows a tax deduction for cars valued at more than $5000. Cars need to be de-registered and are usually collected within three days. In 2008, the National Youth Commission estimated 21,940 young people were homeless every night. Of these, 3,896 were in Victoria. Kids Under Cover has built more than 400 one and two bedroom bungalows, 20 houses and 3 complexes in all corners of Victoria, giving homes to more than 3,000 children. Photo above: Kids Under Cover CEO Jo Swift with the Donate Your Car vehicle Bernie. The above 1972 VW was donated in 2010 and restored by Manheim Auctions. The photo below was provided by Manheim Auctions in Melbourne, and the 1960 Sunbeam Alpine sold for $9,600 and the total amount received for KUC was $32,874 in June 2013. 711 cars were donated for the 2012 / 2013 Financial Year. $362,823 was raised in this period. Compares to 406 cars in 2011 / 2012 and $205,717 an increase in cars and funds of 75% and 76%. Stand out results from the auctions include, a 1960 Sunbeam Alpine sold for $ 9,600 and a 2004 Ford Fairlane sold for $7,000. This is enough funds for seven studios to be built, or give 300 young people scholarships, or provide mentors for 241 young people.